Pervez Musharraf, the President and Chief of the Pakistan Army, has provided us a new model of leadership. Not for him the varied styles adopted by leaders and distilled by scholars over the years; situational, charismatic, participative or authoritative. He has devised his very own headship style, leadership by bluff. The ideal example of this of course is his recently released book, 'In the line of Fire'. Having controlled his men in uniform all these years and done in civilian leadership in Pakistan suavely, did not satisfy the wily general. He now wanted to display his style to the World at large and what better occasion then releasing the book after the heads of state speech in the United Nations General Assembly and before meeting the US President for a tete a tete. Musharraf's timing is masterly and that very respectable think tank, the Council for Foreign Relations obliged the General by providing him an appropriate venue for launch. This made his trip to New York and Washington. The book of course will turn out to be a bestseller. The art of writing a book is manipulation of the hyperbole and Musharraf ably assisted by his ghost writer has achieved it very successfully. That in later years it may be discarded to the dust bin of history may not really bother the General, for at present he is savoring the tastes of a successful winner. Musharraf's style of writing and his anecdotes reflect his personality. Whether it is narrating his bomb making exploits in college or allusions to India having helped itself of a clandestine nuclear network operated by the enigmatic A Q Khan, it is the blunt statements of falsehoods camouflaged in explosive revelations which ordinary men will cringe to challenge even if they do not believe these to be true is what has made his task easy. His declaration that Kargil 1999 was a great victory is a part of this great charade, waged to influence opinion at home, in a crucial forth coming election year when there is nothing much to show, but for a deal with the devil, the Taliban and the coffin of an octogenarian, Akbar Bugti buried without the presence of his kith and kin. It is bluff at its best, by declaring it in such a brash, blatantly untruthful manner, he is sure that he will be able to carry the day through. The majors and sergeants of the Pakistan Army his core constituency, a feudal, archaic force whose forte once again is sham and bluster will be truly impressed. The civilian leadership will soon follow suit and make him a hero who has redeemed the nation from the jaws of defeat in Kargil, at least by words if not by deed. In the world where information is supreme especially in the field of political polemics, Musharraf could well have won the day. But then his balloon of falsehood has perhaps been stretched beyond the bounds of reality and may burst due to excess gas or a pin prick. The outage in Pakistan when he was in America was just one such indication, that all may not be too well in the country. Who will call Musharraf's bluff is the question? Especially when he is relying on outrageousness to numb his opponents. The peril of writing memoirs is that the printed word is etched in the impermanence of history. Thus any falsehood has a recriminatory reeling for years if not centuries. 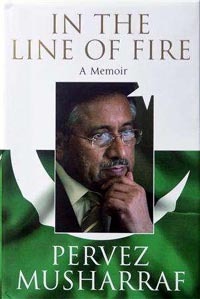 What ever be its sales figures, one can safely say at this juncture that, Musharraf's, 'Line of Fire' will surely not out last Mahatma Gandhi's 'My Experiments with Truth'.